I'm kind of trying to decide which loose ends to try to deal with during this final week. There's a lot that I, sadly, won't get to. 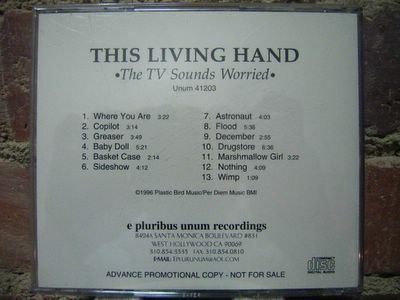 It's hard to believe that one of the few mentions in existence of this album "The TV Sounds Worried" calls it good, but not a classic. For years I've only had a dubbed over many times cassette copy and still I can't stop listening to it. I suggest listening to this album again. The lyrics alone are so specific and haunting in a way that few others (maybe Gillian Welch or Red House Painters) have ever affected me. I appreciated the link to the article rightly calling "The TV Sounds Worried" a lost classic. I popped the CD on yesterday for the first time in a while, after a run in Prospect Park, and kind of enjoyed it more than I thought I would. I also realized that people who 1. like Neilson's voice more than I do (he sounds vaguely like Michael Stipe) and 2. like slowcore more than I do (Low, Codeine, etc.) might really flip over it. I agree with the commenter that it is sad that one of the only online mentions of this album is my kind of half-hearted dismissal (though the Trouser Press review, originally appearing in Badaboom Gramophone, is a rave). Seems reasonable at this point to post the whole thing. First half today, second half tomorrow, time permitting.